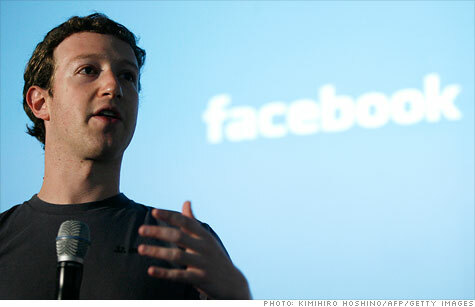 Facebook founder Mark Zuckerberg's 2012 tax bill could be one for the record books. NEW YORK (CNNMoney) -- Facebook's upcoming IPO will make founder and CEO Mark Zuckerberg a billionaire -- but it will also stick him with an eye-popping tax bill that could reach as high as $2 billion. Industry experts say that might be one for the record books. "I personally have never seen a bill into the billions -- close, but not quite," said Anthony Nitti, a Colorado-based CPA and partner with Withum, Smith and Brown. "I talked to a few buddies of mine at the Big Four accounting firms, and it's something not many people have seen." The giant tax hit is a consequence of Zuckerberg's plan to exercise stock options worth billions. The move will significantly increase his ownership stake in the company he founded eight years ago. Zuckerberg currently owns almost 414 million shares of Facebook, but he also holds options to buy another 120 million shares at the bargain price of 6 cents a piece. Facebook said in its IPO paperwork that Zuckerberg plans to exercise those options and will sell some of his shares during Facebook's initial offering to cover the tax bill. The type of options Zuckerberg holds are taxable as ordinary income when they're exercised, even if the shareholder hangs onto the shares and doesn't sell them. That means Zuckerberg will owe taxes on the difference between what he pays for his Facebook shares -- 6 cents -- and their market value the day he exercises the options. Facebook said in its IPO filing that it values its shares at $29.73. At that price, Zuckerberg's options windfall would be worth $3.6 billion. But analysts expect Facebook shares to go for a premium when they're sold to the public. A private-market trade last week valued Facebook's shares at $40 each -- giving the company an overall valuation of around $100 billion. That price tag would make Zuckerberg's options worth almost $5 billion. Either way, the windfall lines him up for a whopping tax bill. The top U.S. marginal tax rate this year is 35%. Zuckerberg's home state of California also carves off a big slice, hitting those with incomes of $1 million or more with a 10.3% income tax. Stock options are a tax swampland, and it's hard to estimate precisely what Zuckerberg will end up paying. But tax analysts are ballparking the total at somewhere in the $1.5 billion to $2 billion range -- a nearly unprecedented sum. The IRS doesn't comment on individual tax bills, but an analysis of the top 400 U.S. taxpayers with the highest reported incomes for 2009 (the most recent year available) shows that the average tax bill for a member of the ultra-1% club was $49 million. The top 400 collectively paid income taxes totaling $19.6 billion. Zuckerberg could single-handedly boost that stat significantly in 2012. Still, accountants said Zuckerberg's tax plan is the right move. The 27-year-old entrepreneur is famously loathe to give up any ownership control over his company, and he plans to sell only enough stock to cover his tax bill, Facebook said in its regulatory paperwork. That means that the rest of Zuckerberg's billions will remain hypothetical paper wealth, and his financial fortunes will stay closely entangled with Facebook's. "He's doing it the smart way," said Stan Pollock, a San Francisco CPA who specializes in stock options planning. "We learned from the dot-com bust that people should do it that way -- sell shares to cover the tax bill." During the dot-com bubble peak in 2000, countless tech industry workers got burned by roller-coaster stock prices. For tax purposes, the value of most stock options is fixed the day they're exercised -- even if you don't sell any of the stock. If you pay $5 to exercise an option and buy shares valued at $30, the IRS views your gain as income of $25. What happens if the stock plunges before you sell any shares? You're still on the hook for the price it was the day you exercised it. "People were exercising options and holding them in anticipation of the stock going up and up. The stock would go and up and up and up -- and then go down," Pollock said. "A lot of people were stuck with huge tax bills and no money to pay the bills." Facebook will also get a significant boost from its employees' stock windfalls. That's because companies can take a "mirror" tax deduction for stock option compensation when the options are exercised. Thanks to its deduction on Zuckerberg's staggering tax bill and other stock-related expenses, Facebook expects to show a net operating loss this year for U.S. federal tax purposes. That means it will qualify for a refund on some of the taxes it paid last year on its $1 billion profit. "We anticipate that this refund could be up to $500 million and payable to us during the first six months of 2013," Facebook said in its IPO filing. Here's the ironic twist: While Zuckerberg's 2012 income will be stratospheric, his 2013 earnings could drop him straight back into the lowest possible tax brackets. At his request, Facebook's board agreed to slash his annual salary next year to $1.